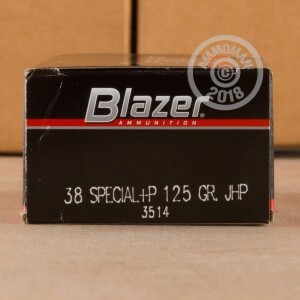 This economical .38 Special ammunition from CCI's Blazer series is a great range or hunting load for .38 and .357 Magnum firearms that can handle +P ammunition. 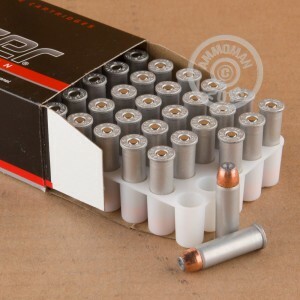 Each cartridge in this box of 50 fires a 125 grain jacketed hollow point bullet at 945 feet per second. CCI Blazer ammunition is made in Lewiston, Idaho using non-corrosive Berdan primers. To help keep shooters' costs down, it uses aluminum cases which provide excellent shooting performance but cannot be reloaded. 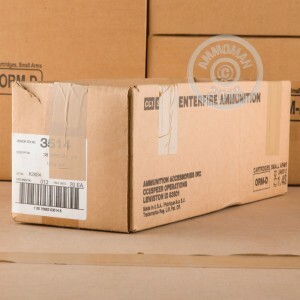 Free shipping is easy to get at AmmoMan.com. Simply place an order for $99 or more to qualify!